Painting process: The board was brushed with Gamsol then a gray mixture was painted into the Gamsol. The painting was completed a la prima. 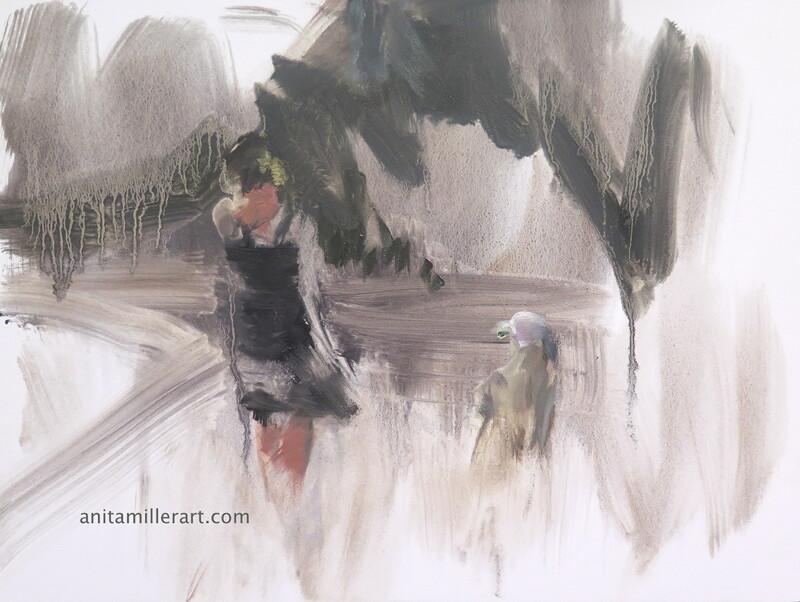 Cadmium yellow light, cadmium red medium, ultramarine blue and such muted tones… love it! Those muted tones are mainly burnt umber and ultramarine blue plus some white…. that combo really gives lovely grays that go from warm to cool depending on the ratio. Thank you, Ana. Happy painting! J’aime les coulures et la façon de poser la peinture. Everything is fine. Just need a little break and have to get ready for some open studios coming up. Thank you for your very kind comments. I like the visceral quality in this one. I like the way the paint comes first when it’s abstract or semi abstract. Nice. Thanks, Hollis. I’m always happiest on the fence between abstraction and representation. I decided not to add all the details and am happy with it. I like how you described it.. visceral. I really went with my ‘gut’ on this one. So weird how that goes sometimes… almost like the painting paints itself. On the contrary… I have a couple open studios coming up and need to get ready for those. For me, blogging goes through cycles. Sometimes, I like to just retreat into my art ‘cave’ and be quiet for a time. Yin and yang, right? As long as I take those breaks I still enjoy blogging. How else to have people all over the world see your work and give you feedback – and we try to help each other : ) Happy painting! Yes, I seem to need more and more, too! Thanks, Linda. Thank you, Susan. Sometimes the quick, simple ones are the best. Anita as always pleasure to come back and enjoy the view!!! Anita, I seem to be on a similar wavelength as you at the moment. I just want to stop in real quick and wish you the best ever of upcoming open studio events!! I can appreciate what you’re saying above re: “retreating into that maker’s cave” to create that new work for your event. While I’m doing the same right now – I’m enjoying this Columbus Day weekend, clicking around, looking at your beautiful paintings and wishing you the best for next weekend! Cheers!! Hi Patricia! If you get two replies from me it’s because I goofed on the first. It looked like it went in my comments instead of a reply to you. So, anyway, I wanted to tell you how much I appreciate your lovely comments to me. I had a not so good day yesterday after confronting another artist in a studio near me about their noise level. The problem with being in a large art center with lots of studios is frequent turnover of artists and “reestablishing” boundaries, ie. noise, smelly solvents, etc. Oh, well, let’s just say I will not be winning any popularity contests! How are you doing? I bet you have another stunning piece in the works and I shall drop by soon. My break is almost over, I think. I wish you all the best! I’m taking a short break from blogging too at the moment – so no need to worry about me!! I soo hear you re: having to work alongside others in a larger community. I had a really interesting talk w/ a Philly painter recently when I asked her about trying to work in the same type of setting you’re describing – and I loved her answer to dealing w/ “studio neighbors” when she said bluntly, “Oh! Don’t you HATE that!? ?” Made my day, and I sure can appreciate what you’re dealing with. Hang in there, as the work I’m seeing on your blog is some of the best I’ve seen yet. You must have an incredibly strong sense of focus – as these paintings look so together and strong. Best for your upcoming studio event, Anita! Will drop in soon after my blog break is over!! Well, Patricia, I hope you have a wonderful blogging break. It is so nice to just retreat away from everything for a while. But, it’s people like you who keep me coming back. Thank you again for your wonderful encouraging words. And I enjoyed reading what that other artist had to say and I hope she resolves her struggles as well. (Or maybe we can just channel our frustrations into some new “masterpieces”! ) Stay happy and well, Patricia… see you again soon. Love this Anita. Beautiful composition.